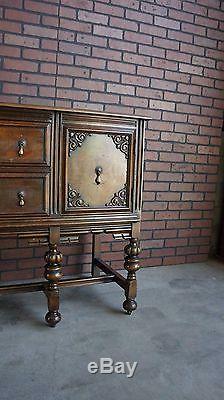 This antique sideboard is incredible in both style and quality of construction. The applied details on the doors and the lovely vintage hardware add abundant charm. The turned legs ground it nicely and the simple backsplash tops it off. The drawers open and close with ease and give this piece versatile and ample storage. Give this buffet/sideboard an updated vibe with one of our signature time worn finishes. Or select a custom color, convo us for details and pricing. Dimensions: 66 w x 21 d x 37 1/4 (38 1/4 w/backsplash). 90 DAY LAYAWAY AVAILABLE PLEASE INQUIRE. EUROPEAN FLAIR SIGNATURE PAINTED FINISH PROCESS. Vision, passion and technique are all a part of our Paint To Order finishes. We take pride in customizing our pieces to suite our customers preferences. We use a wide variety of paints including Benjamin Moore. Milk Paint and Modern Masters metallic finishes. Of course we are always happy to use our customers choice of paint company and color. Our finishes are a multi 7-10 step process including prep, painting, hand rubbed distressing. Glazing and the final step providing a factory finish. Let us transform one of our special pieces into an extraordinary one of a kind masterpiece just for you. At European Flair we take the extra time to repair any minor wear issues. With our multi step finish renewal process. Making our pieces represent the best of their original finish. Even though we sell vintage and antique furnishings we realize the piece will be new to you. We look for features such as dovetail drawers, corner blocks, detailed carvings and intricate hardware. Our gently used pieces come from quality manufacturers. We inspect each piece, make necessary repairs and paint or refinish as needed. Then distress or rub through finish by hand to add vintage, time worn style. We love giving old pieces new life. Paris Chic English Countryside Tuscan Farmhouse Our inspiration comes from all things European and "Bella" (beautiful). It is important to note since our items are available at a variety of locations. If you are interested in an item that has been removed please inquire. Terms of Sale European Flair items are vintage & antique they may have age-consistent wear & tear. Many pieces have had repairs sometime in their history & may have been customized. We take care to be sure our photos and descriptions are an accurate representation of each piece. Timeline can change based on order volume. We offer a free 90 day Layaway. Note: Remote locations and stairs are an additional charge. The timelines below are only an estimate as many factors. Blanket Wrap, White Glove Deliveries 14-28 days. The item "Buffet Sideboard Server Vintage Buffet Antique Sideboard" is in sale since Saturday, May 6, 2017. This item is in the category "Home & Garden\Furniture\Sideboards & Buffets". The seller is "bellawood1" and is located in Eugene, Oregon. This item can be shipped to United States.